I tried to purchase Infuse Pro 6 through "Complete My Bundle". However, the bundle I purchased charged me in full price. 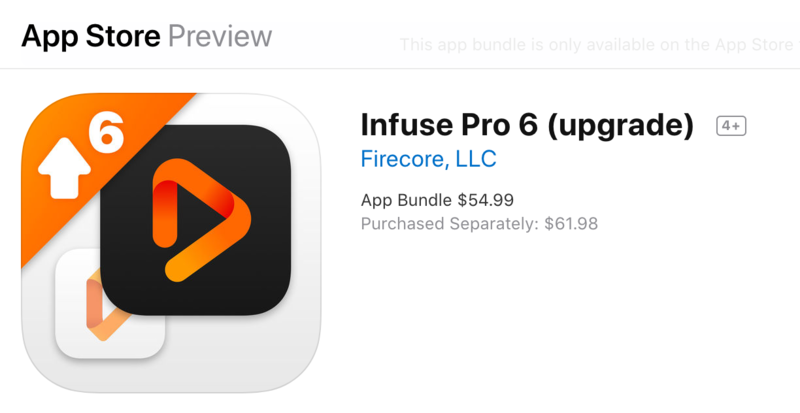 "App Store charged me again for Infuse Pro 5." Here is a screenshot prior to purchasing the bundle. 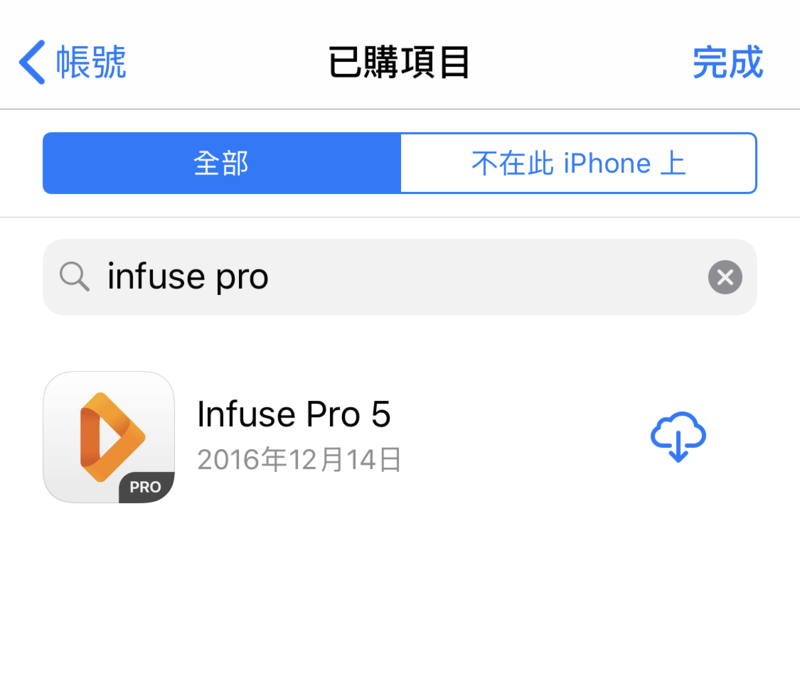 I already owned Infuse Pro 5 and can download it. The full price of the bundle is 1,050 TWD (1,200 TWD if purchased separately. 750 for v6 and 450 for v5). So I was expecting that when purchasing, it would charge me 600 TWD. However, this is my invoice. I was charged not only for Infuse Pro 6 but also for Infuse Pro 5. I already requested for a refund. But I would like to know if there's any other option I can purchase a standalone Infuse Pro 6 with an upgrade discount. 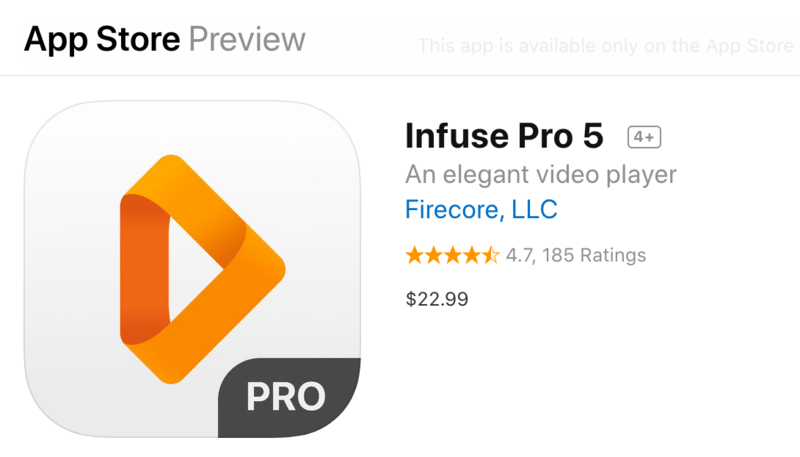 By chance, did you originally download Infuse Pro 5 with a promo code? It seems Apple will credit you with the actual price paid when purchasing a bundle, and if a promo code was used then the bundle may not be a good option. Another option would be to go with the lifetime license available in the free Infuse 6 app, as you would still be able to receive the discount for that. But no, it's not a promo code download. It was a purchase dated back to 2016. Here's a screenshot of my previous purchase. And that's why I'm annoyed that Apple charged me twice. I might consider subscriptions. Perhaps. It just that I prefer owning the pro app directly. So subscriptions are not so attractive to me. Thanks. The bundle isn't appearing correctly for some people, and we're not sure why. We've submitted a 6.0.1 update to Apple today with a few other fixes, so there's a chance this issue will resolve itself by releasing a new versions on the store. Perhaps my problem is similar. Since I already owned Infuse Pro 5, I choose to purchase the bundle. 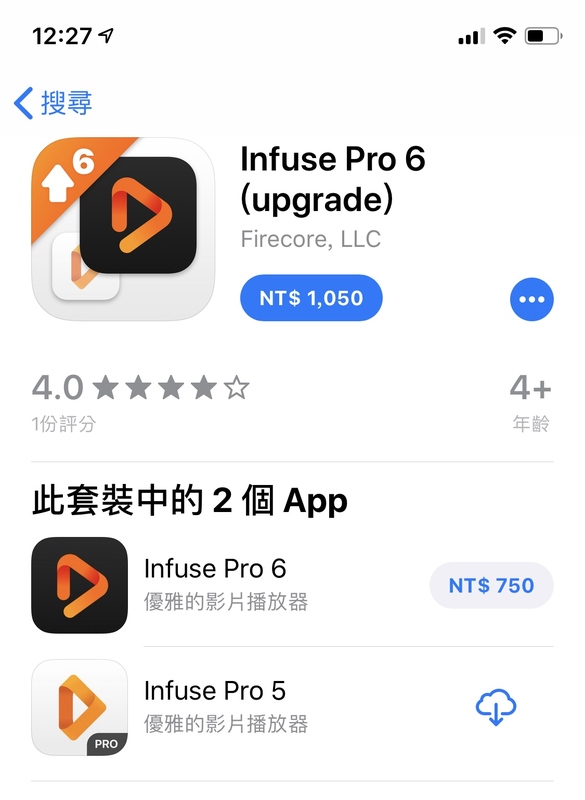 Now I have the app correctly installed on my iPad and my Apple TV (where I found "Infuse Pro 6" among my App Store puchased apps), but I can't install it on my iPhone, since Infuse Pro 6 doesn't appear on my App Store purchased apps. I know, it's very strange that I see different situations on different devices, all using the same Apple ID, but that's it, unfortunately. Moreover on the iPhone I see I bought the bundle, but Infuse Pro 6 doesn't care and it's asking me to pay again. For completeness, I attach some screenshots of what I see on my iPad and my iPhone. I'm waiting for an help to solve this, since I already paid 26 euros to made the upgrade and I don't like to buy again the same app just to be able to install it on my iPhone. @MarcoCav I wish I were as lucky as you are. Sadly my problem is a bit different. It's my purchase of "v5" that being ignored by Apple. Actually I read james's post before my purchase. And I expected that "since I owned Infuse 5 Pro already, I won't purchase it again". Well, App Store did charge me again. Even now, after v6.0.1 released, App Store still display the bundle in full price. I guess my only option is subscribing. Hey whats the app's price in AUD using the complete my bundle? At the moment Pro 6 is showing up at Australian $38.99 and the bundle is showing as $54.99 with no option to complete the bundle even after purchasing Pro 5 when it was released and having Pro 5 currently installed. It looks like your issue is quite similar to mine. I expect the "complete my bundle" price being that subtracting the price of app you already owned. That is, 54.99 - 22.99 = 32 AUD. By @james's explanation, the subtrahend (22.99) may vary by how much you paid for v5. So you may also want to check your purchase history. What I did is searching on iOS App Store Purchased Items for the date I placed my order. And then using iTunes on my Mac to view my account's purchase history on that date of ordering. This will provide you the order history like the one in my comment #3 above. Ahh there's the problem, I purchased it basically as soon as it was released and iTunes doesn't seem to save records that far back. I'm certain i paid full price for Infuse Pro 5 though but it's still showing as $38.99 and the bundle is still $54.99. Is 38.99 the price with the discount? I don't mind paying that much for it, i just don't know how much Infuse Pro 6 is supposed to be priced at wholesale right now without any sort of discount. Is 38.99 the normal price or my discounted price? I might have figured out the reason as well. I purchased Pro 5 (in US dollars) when I was in the US. But now I'm purchasing in TWD. It seems that App Store fails to deduct 12.99 USD from the 1,050 TWD bundle price. So I was charged again. Guess there's no way to fix this. Apple has (finally) gotten back to use, and believes the issue should be resolved as of Saturday afternoon. If you are still seeing issues with this, please let me know and I can try and follow-up with them. Unfortunately, Apple doesn't allow purchases to transfer between App Store countries. Sorry.